The legendary home of Warwickshire will stage five fixtures, including a semi-final and England v India. Having been established in 1882, it’s fair to say that Edgbaston – home of Warwickshire County Cricket Club – has been the venue for some historic moments, including Brian Lara’s knock of 501*, the highest score by a batsman in first-class cricket. It has been a venue at four previous ICC Cricket World Cups, and was a semi-final location in the 1979, 1983 and 1999 editions. 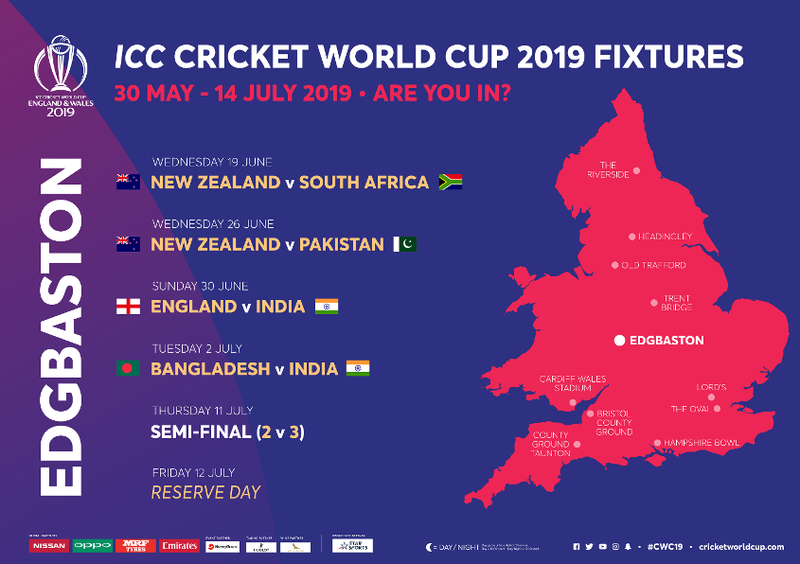 It will host five games at the ICC Cricket World Cup 2019, including one semi-final and the high-profile meeting of England and India. Cricket fans will remember Edgbaston’s 1999 World Cup semi-final between Australia and South Africa as arguably the greatest ever ODI. Allan Donald and Lance Klusener were the men at the crease that day, with a mix-up in the middle when the scores were level meaning Australia progressed to the World Cup final. To find out more about the accessible facilities and services at Edgbaston, check out the CWC19 Access Guide here. Plan ahead so you can make the most out of your day at Edgbaston during the ICC Men’s Cricket World Cup 2019. For Edgbaston, we advise spectators to leave the car at home and use public transport to travel to the venue. Walking and cycling are good options for those staying close by – with secure cycle parking available at the venue. The main train station for Edgbaston is Birmingham New Street, which is only 2 miles away from the stadium. There are a further two train stations in the city centre - Moor Street and Snow Hill - which are a short walk from New Street Station, where the event shuttle picks up and the Edgbaston walking route begins. Many local buses can be used to get to Edgbaston. The 45 and 47 services travel from Carrs Lane in the city centre to Pershore Road – two minutes’ walk from the venue. Several other services have stops on Pershore Road and Priory Road which are within easy reach of the venue. There is limited official parking available and this must be booked in advance - more information will be available in early 2019. Please note, the residential streets around the venue are subject to parking controls and not suitable for those attending the match. There are also road closures in place which means there may be delays leaving after the game. All of the public transport options are suitable for those with accessibility requirements and there is some on-site blue badge parking available which can be booked through the venue. Birmingham is the largest regional city in the United Kingdom with a population of over one million. It’s also one of the youngest cities in Europe with almost 40% of its population being under 25 years of age. Situated in Central England, 90% of the UK is within four hours of Birmingham. Once famous as a 'City of a Thousand Trades', Birmingham was a world leader in the production of pens, buckles, buttons, jewellery and guns. It is also the home of a number of international food and beverage companies. 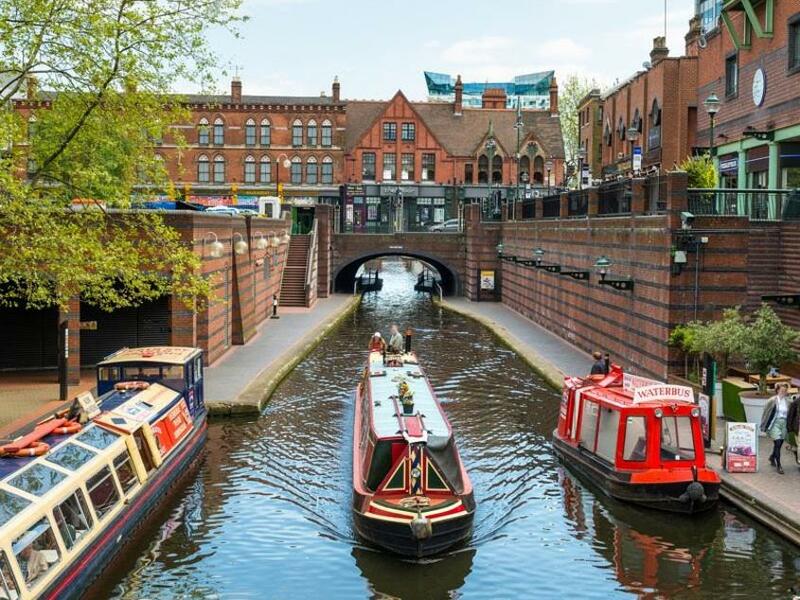 Other big cities are green with envy when you mention Brum's six million trees, and more than 8,000 acres of parks and open space, Birmingham is one of the greenest cities in the UK and Europe, as well as having more miles of canals than Venice. Famous Brummies include; UB40, Black Sabbath, The Editors, Jamelia, Lord of the Rings author J. R. R Tolkien, actress Julie Walters, actor David Harewood, comedians Frank Skinner, Lenny Henry, Meera Syal, Jasper Carrott , athlete Denise Lewis, chef Glyn Purnell, as well as famous cricketers Moeen Ali, Chris Woakes, Dennis Amis, Frank Foster and Eric Hollies. Birmingham has a proud track record as a city of sport. We have hosted more European and World sporting championships than any other city in the UK. The city also hosts over 50 festivals each year, including the Moseley Folk Festival, Flat Pack film festival, Fierce Art Festival and the massive Birmingham International Jazz Festival.